Other mistake: When Tommy Lee Jones calls up the asset as he lands in Las Vegas you can see him holding the mobile phone upside down with the camera near his mouth and microphone up. Factual error: When Bourne first arrives in London, the Audi he is driving is quite obviously left hand drive. In the UK his car would be a right hand drive. Factual error: In the car chase, the SWAT truck throws cars in a traffic jam upwards and to left and right, as if it had a large, pointed snowplough type structure mounted to its front bumper. The front of the truck is squared off and blunt - it would just shorten the car in front - as some of us know from tail-ending experience. Suggested correction: The truck was moving at high speed, which would have applied a large amount of momentum on the bunch of cars in front of it. I agree that the destruction is a little exaggerated, but it is possible for a car to be sent flying in some direction when an armored vehicle rams it at high speed. Other mistake: In one of the car chase scenes, Bourne has to turn left down a street because the police have blocked the road ahead. Soon afterwards, he has to turn left down another street because the police have blocked it off too. The same footage is used again. Factual error: When Jason Bourne drives into Bally's on one side then exits the other side he goes right from Bally's into the Riviera. The Rivera (before it was torn down) and Bally's were a couple of miles apart from each other. 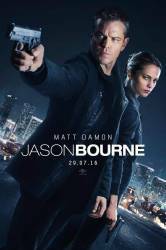 Visible crew/equipment: After the police truck crashes into the casino, Jason Bourne gets out of his car and continues his pursuit. Walking down a hill, the camera and operator are shown in the wet reflecting concrete. Continuity mistake: In the chase scene between the black Dodge Charger and the Police SWAT truck, the damage to the left side of the Charger alternates frequently between damaged and un-damaged. Factual error: Virtually every time anyone is seen hacking with an IP address on screen, the address includes the number 256. IP addresses only go up to 255. Factual error: In Vegas they are attending Exocon 2016. Heather Lee gets a text message from Bourne to meet him at the north elevators, the date on her phone is Tuesday 20 October. That date occurred in 2015, not 2016. The Las Vegas car chase sequence took five weeks to film, causing the wreckage of 170 cars.